It has been 6 months since my last Portland post! Out of the 4 full days we were there, Day 3 was probably the best day. In the other two posts I think I eluded to a gluttonous day on our trip when we pretty much didn’t stop eating from our first bite at breakfast to our last semi-drunken meal. The details may be a little fuzzy, but my taste buds will help me bring all the memories back. First stop, breakfast of champions…pizza. This place was just around the corner from where we were staying. The night before we were looking for a late night snack and stumbled here, but they were closing so no nightcap slice of pizza for us. I guess both of us dreamt about our missed pizza connection because we both wanted to start the day with pizza! Each slice was $3.75 which was a little pricey for a slice of pizza I feel but it was just enough fuel to get our day started but didn’t stuff us like the day before. If you need a quick bite stop on by! Since it was a Saturday, we heard there was a Farmers Market by the river walk so we went on an adventure to find it. On our way there, we found an food and arts festival (we think). I guess at this point we burnt off our pizza (no we did not) so we got a GIGANTIC corn dog and strawberry lemonade to share. Yes…we did. We walked in the rain and happened to be close to one of Portland’s best –Stumptown. We heard so much about this place and saw their coffee mentioned everywhere in Portland. Salt & Straw had a flavor dedicated to their coffee on the permanent menu, and a friend of mine wouldn’t stop talking about her Stumptown withdrawals. We went to see what the hype was about. We managed to find a seat in the large cafe with strangely limited seating. The boyfriend stood in line as I held our seats like we were saving spots on the playground…I put my foot on his seat for good measure. He ordered an espresso (I think) and I couldn’t handle the pressure and just ordered a mocha. The barista was not pleased with my indecisiveness and I felt the disdain in his eyes even though I wasn’t even talking to him. We ordered coffee…not attitude…thanks. I have to say though, their mocha is still the best mocha I’ve had EVER. The coffee wasn’t lost in the drink even though it was super rich and creamy. I’m happy that they opened a up a cafe in Los Angeles (and a Salt & Straw)! Hopefully, they left the snobby attitude in Portland. It’s like the Rihanna and Neyo song… I hate that I love you, Stumptown. After our tummies were warm, we walked over to Powell’s bookstore to meet up with my best friend! She happened to be in town to visit her family, so we had to meet up. When we found each other in the maze of the bookstore, her brother who is a brewer recommended a couples places for us to try out. One of the places he mentioned happened to be on the other side of the river, a place we didn’t even think of visiting. We hopped on the street car and made our way across the river. It wasn’t as flashy there and there weren’t as many people walking around. We found the people…they were all hiding from the rain and getting their drink on! We got to the brewery that had a restaurant/bistro. We found a seat and got to ordering. 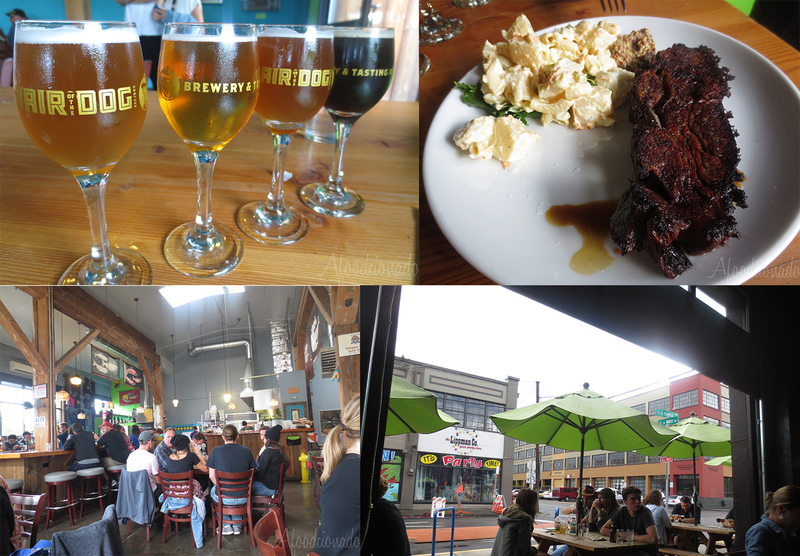 We weren’t super hungry, so we shared some stuff…aka a flight of beers, a cider, and a braised short rib plate. The flight really got the buzz going, and the cider (not pictured) kept it going. The short rib was AMAZING there was a slight crust so you got a little crispy piece with every bite. The salad..I don’t remember it too much but I remember everything was delicious. Though, now that I have made braised short rib on my own (Our Guinness braised short rib ) we don’t have to crave the one we had here. Once we got a nice buzz going on here, we chatted up our waitress who told us about an awesome bar nearby that we could go to that had great happy hour deals. Uhh chyea…lessdoit. I think we walked over to this place…yes we did because we were talking near another guy who started to pick up his pace when he noticed us. Hey man…we’re harmless. The place was empty when we got there, but we were getting there at an odd time. We sat ourselves and checked out the menu. I don’t remember what I drank but I know we had a few drinks. No, we were not THAT drunk. I remember the boyfriend was feeling oysters and we found some albeit little. They were creamy and that vinaigrette up there really worked with it. I tried to give bacon wrapped dates another try since this version was filled with cheese. I’m still not a fan. Sorry. Dates are not my thing I guess. What was cool was the different salts and little specialty items in the little market that lined the wall. It would be a great place to get a unique present for someone. Our bartender was super friendly, knowledgeable, and gave us our space when we needed it. A couple ladies came in and chatted us up and shared some Portland culture with us. 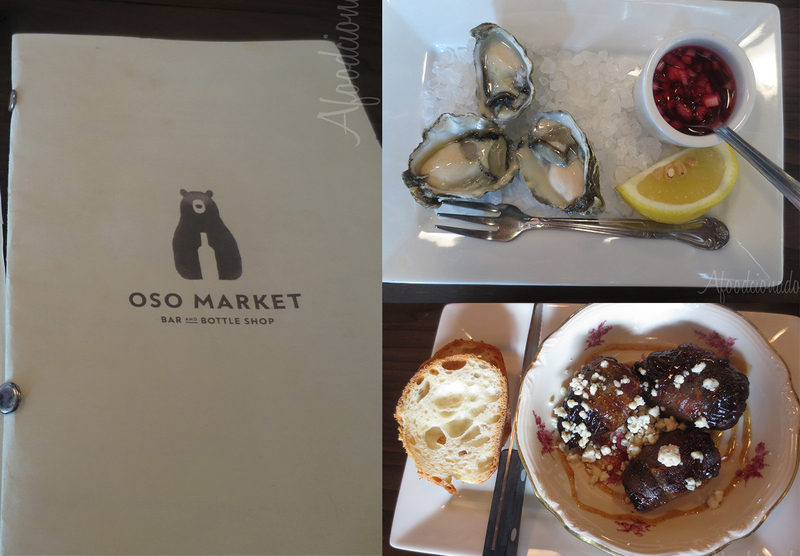 When we were winding down at Oso, the bartender recommended we try their neighbor, this little place known for their awesome Vodka selection and Russian food. OK. I. LOVE. THIS. PLACE. No, that’s not the alcohol talking. We sat at the bar enveloped in the homey bubbe’s dining room environment. It was still happy hour when we got there and what a happy hour it was. Let’s start with the drinks. We ordered the chamomile infusion and the rosemary infusion later. We got 100g and it was enough. I never had vodka that tasted to smooth and clean with flavor and alcohol content that did not overpower your senses. Of course, if vodka isn’t your thing well…hmm I guess there are other drinks here for you, but come on when in Russia! We didn’t eat THAAAAAT much here. We had the little crab crackers that was $1. It doesn’t seem to be on the HH menu anymore, but they tasted a lot like the asian shrimp chips if you’ve ever had them. THOSE DUMPLINGS DOH!! The middle is the siberian pelmeni – dumplings filled with beef, pork, veal and onion. These were dangerous. They are little and so savory and delicious with the dollop of sour cream? on top O.M.G. I didn’t want to share, and definitely considered getting another order. The right photo is the tvorog vareniki – scallion and farmer’s cheese filled dumplings. These were delicious also, but it was a little bland after eating the pelmeni flavor explosions! Still…delicious. I. LOVE. THIS. PLACE. The day definitely ended on a high note. 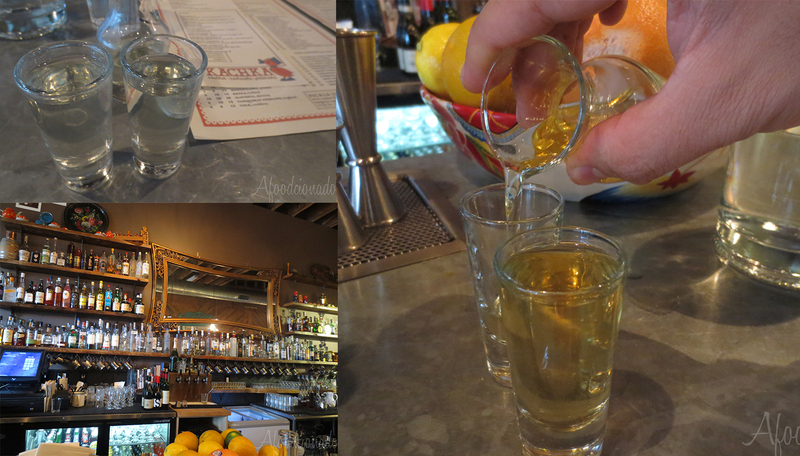 As you can see, this day was like a happy hour bar crawl/Portland tapas… don’t know what you want to call it, but it was DEE-LICIOUS.